Happy New Year Martinborough. So far January has brought some highs and lows but, every new year, brings new beginnings and new hope. February 11, 2019 February 2019 Comments Off on GREAT SOLIDARITY IN MARTINBOROUGH”. The sudden and provocative decision by the Parish Administration in Masterton to close St Anthony of Padua Catholic Church in Martinborough late last year left us, the local Catholic community, to review and sort out our immediate destiny including our usual Christmas Eve Vigil Mass and Carols celebrations. Suggestions and offers of alternative venues from other local Church denominations were considered. 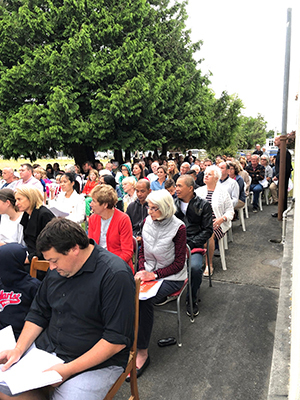 However past numbers for this celebration of at least 170 plus and the need to retain our historical presence in Martinborough left us with the clear view we had to be on site for Christmas and beyond.…..even if this meant being outdoors alongside the church building and under the trees on the church property. Saturday and Sunday 1 pm until 5.30 pm.